The Pyle Pro P1501ATU is the perfect solution if you are looking for a High-Fidelity Preamplifier and a Power Amplifier all in one. This Receiver / Preamp features two sets of RCA inputs, RCA line out for recording, RCA preamp out, 2 Mono RCA's for subwoofer output, and iPod and MP3 player input via 3.5mm Cable. Plus, a USB port to plug in your favorite digital music. Seperate gain control for preamp and subwoofer channels makes it easy to fine tune the levels of your audio. 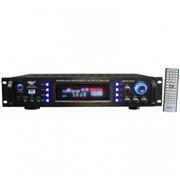 The P1501ATU produces 1500 Watts Peak Power, 500 Watts at 2 ohms, 400 Watts at 4 Ohms, and 220 watts at 8 ohms. Pyle has been in business for over 35 years, and their manufacturing experience and expertise is easy to see - and hear.